I went to a further supermarket, but that particular day they closed their whole freezer section. Thus I spent around one and a half hours wondering around my quarter before I found spinach. It felt so unbelievable that I got twice as much as I needed and returned to the kitchen. Now I was just some half an hour away from my food. 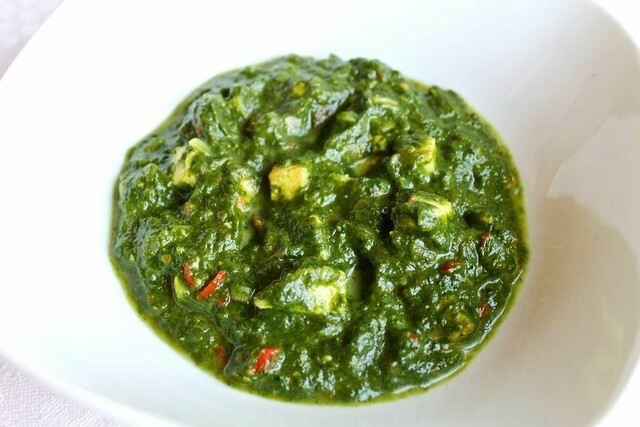 Palak paneer is another Punjabi dish I love. To me it is same great as makhani dal. It translates as "spinach and cheese" and that's what it is. I tried it cooked many different ways and realized that some of the details really make a difference to me. E.g. I like when the spinach is finely processed and you can't taste any fibers. I also like when some cream is added to the spinach puree. It makes the gravy absolutely delicious. And if paneer cheese cubes are slightly fried in advance, till they get a little crispy brown on the outside, the whole thing becomes just divine. There is one other interesting variation, which can compete with the above mentioned. I met it just once in one of the Indian places in Paris. There the whole thing (both spinach and paneer) were processed together into a rich, thick and creamy paste where you couldn't taste any paneer separately. I guess, I'll try to recreate it next time. Talking about ingredients, paneer cheese, which is used a lot in Indian cooking, is a firm, white cheese. It is not salty and not sour (almost flavorless). It doesn't melt because of heat, so you can fry it in hot oil and it get's crispy on the outside. I don't know a place in Moscow to buy it ready made, so there are two ways to go. You can substitute it with some equivalent ready made cheese. From cheeses available in Moscow I know that Адыгейский cheese (available in most supermarkets) fits. Or you can make paneer on your own from milk and a bit of lemon juice. It seems not hard at all, but I still have to try it. All the spices I get either from Indian spices store or from Chinese products store. Don't be alarmed that the recipe looks long. It is not at all complicated really. I suppose the classic way to eat it is either with steamed basmati rice or with Indian bread. It can also be part of thali meal together with my beloved makhani dal, some curries etc. However for me frankly speaking palak paneer is self sufficient. I prefer it on its own. No rice, no bread. It is up to you to pick your way. Cook the spinach in ½ cup of boiling water for 2 minutes till it is completely soft. Process (together with the cooking water) till it turns into smooth paste. Set aside. Chop the paneer into 1 cm cubes. I prefer paneer cubes pre-fried, though this step is optional. In a medium frying pan heat some vegetable oil (should be approximately ½ cm deep). When oil is hot, add the paneer (make sure it fits into one layer, otherwise leave some out and cook it as a second batch). Cook on high heat for around 5 minutes, turning cubes occasionally, till they are evenly browned on the outside. Transfer the paneer cubes on a paper towel and set aside. In a medium pan heat 2 table spoons of vegetable oil. Add the onions and whole garam masala (if using ground garam masala do not add it yet), add a pinch of salt. Cook stirring on medium-low heat for around 5 minutes till the onions are completely soft. Add garlic, ginger, fresh chilli and turmeric and cook stirring for another minute. Add the tomato and keep cooking for some 5 minutes, till it almost turns into puree. Add cumin, coriander, dry chilli and fenugreek and ground garam masala (if using) and mix well. Add the processed spinach, mix well and cook for several minutes on low heat till you get the right creamy texture. If it is too thick, add a bit of boiling water. Add the fried paneer and cook for another minute. Check the level of salt. Mix in the cream. Serve hot. It keeps in the fridge for a couple of days. I guess it doesn’t keep so well in the freezer, especially if you used cream, but I didn’t test this.